Providing community services, space and connections is getting tougher. Historically the domain of churches and temples (sometimes still the case) and technically a council responsibility, this critical element of local support often relies on vulnerable funding – and always on lots of good will. Local trusts across London and the UK have been delivering that support for decades, and it may be time for them to play a bigger role. Whether their mission is housing, education, health, employment, culture or other, local / community trusts are all deeply concerned with the constituents they serve and with earning their trust; they have access to extensive area knowledge; they embody the kind of diversity policies and practices FoL champions; and they’re ready to partner (though all would insist that they’re not just ‘bid candy’). Future of London has started coordinating an informal network of these trusts and similar entities to help them build resilience. 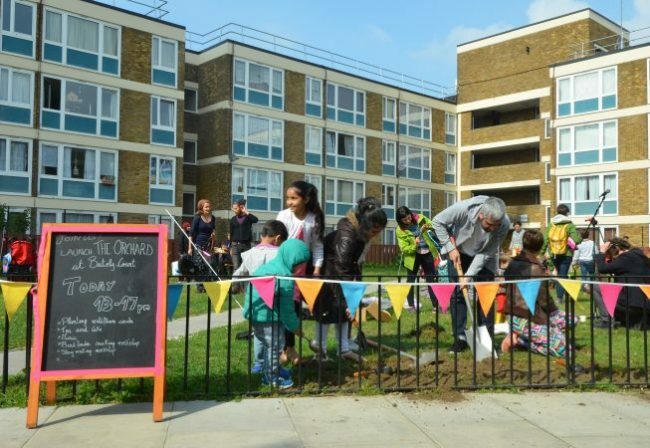 The group was the brainchild of Paul Augarde, Poplar HARCA Director of Placemaking and leader of its Accents team, which focuses on socio-economic and cultural change in East London. 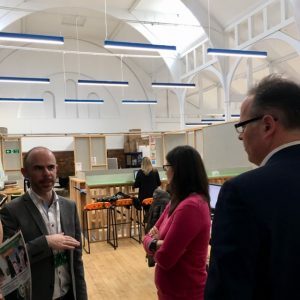 The groups involved to date are below; so far, activities have included a tour and working lunch at Westway Trust and at South Kilburn Trust’s new centre, The Granville. 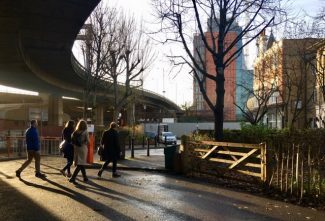 Westway joint CEO Alex Russell walked colleagues around the Trust area, a 1.6km stretch beneath and adjacent to the Westway flyover. The 9.3ha of land was handed to one of the UK’s first community trusts in 1971 as part compensation for the massive disruption of the motorway slicing through the area. TfL now owns the land, while Westway Trust manages most of the space on a long lease. The evolving area is home to 120+ independent businesses, charities and clubs, plus cultural venues and a major sports centre, together employing more than 850 people and used by groups from across North Kensington’s varied demographics (see FoL’s Overcoming Barriers report for more on how the trust is working with stakeholders to connect the area better to nearby jobs and services). Westway Trust was also an integral part of the response to the Grenfell Tower disaster, providing shelter, support and a hub from day 1. This kind of local, immediate, flexible response has real value. South Kilburn Trust CEO Mark Allan, the group’s most recent host, has ambitious plans for the mixed-use Granville centre, refurbished with Brent Council and GLA funding (and up for an AJ award). The Granville offers affordable workspace, community space, events, a great café and a radio station hosting local shows. 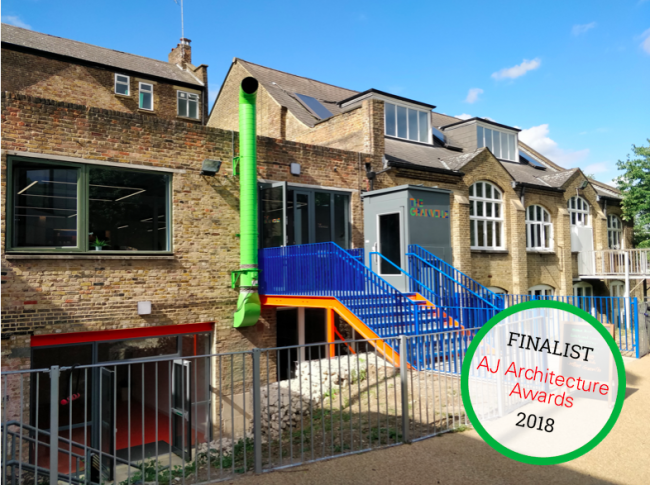 The centre opened in May 2018 and is 92% occupied, including creative groups who moved over from South Kilburn Studios. Unlike commercial or grant-funded entities which may specialise in tech, art or makers, the Granville opted for a healthy, locally representative mix ranging from a basketball association through a cake-maker to a care agency focused on the Somali community. About half of the units now pay subsided low rent; Allan says the goal is 25% subsidised, with market (or closer-to-market) rents funding services as tenants become more self-sufficient. Other group members include Shoreditch Trust, which helps people “improve their health, wellbeing, social networks and opportunities”; Roman Road Trust, a citizen-led regeneration group whose exiting CEO, Tabitha Stapely, saw the area go from being “invisible” to offering a broad array of co-produced projects; Alexandra Palace, set up to manage the huge heritage building, park and an ambitious leisure and entertainment offer; and Wandle Valley Regional Park Trust, which is finding ways to combine environmental assets with community and development partners to do more for people living along it. The newest member of the group is YMCA St Paul’s Group, a “large but local” charity working across much of London to support vulnerable and homeless youth plus children and families, and offering inclusive activities across five health and wellbeing centres. CEO Richard James, who often cycles across the city between YMCA facilities and housing sites, says working with boroughs is key to making the most of their respective resources. The Group is a pioneer in modular housing, having tested Y:Cube and other models, and is keen to provide more safe and home-like supported and temporary housing. No matter how productive they are, these groups can be vulnerable to budget, land, planning and support pressures: among other things, charities have said they’re concerned about the impact of Brexit on funding, staffing and EU volunteers. Local trusts can also go unrecognised and unsupported for long periods, and working up “star” campaigns is difficult for small outfits. Westway’s Alex Russell, speaking at a 2018 FoL Steering Group dinner on the draft London Plan, called for a larger role and more support for trusts in the plan; as the Examination in Public rolls on, these groups will be watching with interest as issues they manage are debated. Find out more about the trusts and related groups Future of London works with below (the top four are members, so you may run into them at FoL events). If you work for or know of a similar group that might benefit from being involved in this loose network, get in touch! You may also be interested in the findings from FoL’s Communities in Transition field trip series, which explored local change across the city-region from 2013-2015 (and continues as a theme! ).